Explore the drama, wisdom and insight of the prophecies of Jonah, Micah, Nahum and Habakkuk. The major prophetic themes of the destruction of Israel's enemies, the judgment of God upon Israel when she turns from him, and the peace that would result from living in harmony with God, are all here. There are also Messianic and future prophetic themes - such as the eternal reign of a king from the line of David (Micah) and the desctruction of Jerusalem (Zephaniah). This fascinating period of Bible history is full of drama, wisdom and insight. 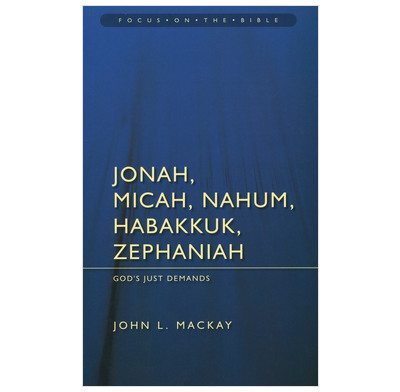 I have only used the commentary on Jonah so far but, if that is anything to go by, look forward to reading the others soon. Mackey's comments are helpful, sensible and easy to read. He refers to various scholarly debates at different points without getting bogged down or losing his clarity. The study questions at the end of each chapter are useful for reflecting further on the main themes. I am very grateful to have this book on my shelf.